Over 600 deaths in psychiatric wards, prisons and police cells were preventable and were caused by repeated mistakes made by mental health care staff, an inquiry has found. The probe focused specifically on adults who were detained on psychiatric wards, in prisons and in police cells between 2010 and 2013. It found a series of basic errors were responsible for preventable deaths – including a failure to integrate families. The report, conducted by the Equality and Human Rights Commission, examined the cases of people who had been detained for various reasons. Among these, were people with mental health conditions who had been detained in prisons and in police stations, and people who had been admitted to hospital for their own safety. The study reveals 367 adults with mental health conditions died of “non-natural” causes while detained in police cells and on psychiatric wards during this period. Some 295 died in prison. While not all deaths were avoidable, the commission said simple interventions could have prevented most of them. Non-natural deaths included suicides, homicides, deaths caused by another person and accidental overdoses, according to the report. The commission was particularly critical of NHS oversight. Its inquiry revealed no state body had become responsible for ensuring deaths in custody are investigated. The commission worked with patients’ family members, and a range of state bodies including the Care Quality Commission (CQC), Her Majesty’s Inspectorate of Constabulary and the Independent Police Complaints Commission (IPCC). Its report found high-risk patients are not sufficiently monitored, and families are often not adequately involved with patients. It also found poor communication between staff, and the fact that their use of inappropriate restraint worsens matters. Chief executive of the commission, Mark Hammond, said the inquiry had uncovered “serious cracks” in the state’s mental health care services. Hammond stressed immediate action is required to start a “fundamental culture shift” in how mental health patients are cared for in the UK. The commission’s report recommended the introduction of trigger systems in hospitals and prisons to inform staff of issues that increase the risk of self-harm. It also recommends a mental health liaison officer be assigned to police forces to provide training. Following the release of the commission’s report, the Department of Health said it’s calling upon the NHS to commit to a new “zero suicide” program. Officials hope to replicate a mental health care program in Detroit for depression. The American scheme has achieved a record of zero suicides in just two years. In January, Deputy Prime Minister Nick Clegg hosted a mental health conference, which brought together leading policy makers, clinicians and campaigners to debate the future of mental health services in England. During the conference, the deputy PM called upon NHS trusts nationwide to commit to striving for a “zero suicides” record in their locales. Clegg said the program wasn’t about blame. He stressed it was about doing more in each area of society to ensure that vulnerable people get the support they need. “These deaths are unacceptable and action to prevent them should be undertaken with urgency,” he told the Independent. Deborah Coles, co-director of bereavement charity Inquest, said the report’s recommendations are nothing new. “Too many deaths in detention are preventable and reflect a failure to implement learning from previous deaths,” she warned. Almost 4,700 people died after taking own lives in England in 2013 – 78 percent were men. Suicide is one of the most serious ‘killers’ for men under 50 in Britain, according to official figures. In 2014, the number of suicides in English and Welsh prisons peaked at a seven-year high. Eighty-two inmates took their own lives during this period. 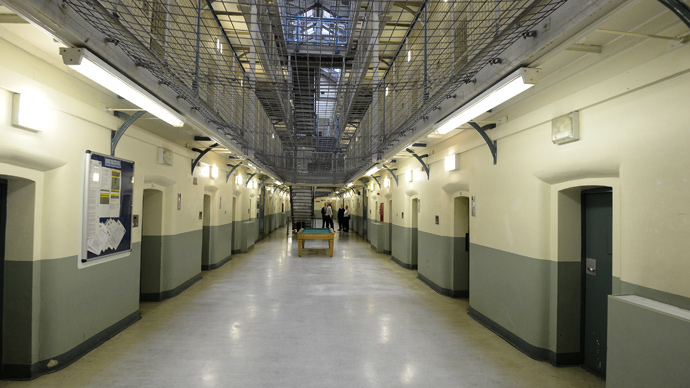 UK charity the Howard League for Penal Reform says the problem relates directly to cuts in government spending.